Currently, we live in a world full of pollution, partly produced by its citizens. Many of the daily activities produce this pollution even without us being aware of it. That is why we must become aware of this and try to do our best to prevent this situation from getting even worse. Bit by bit, we are destroying the nature on our planet. 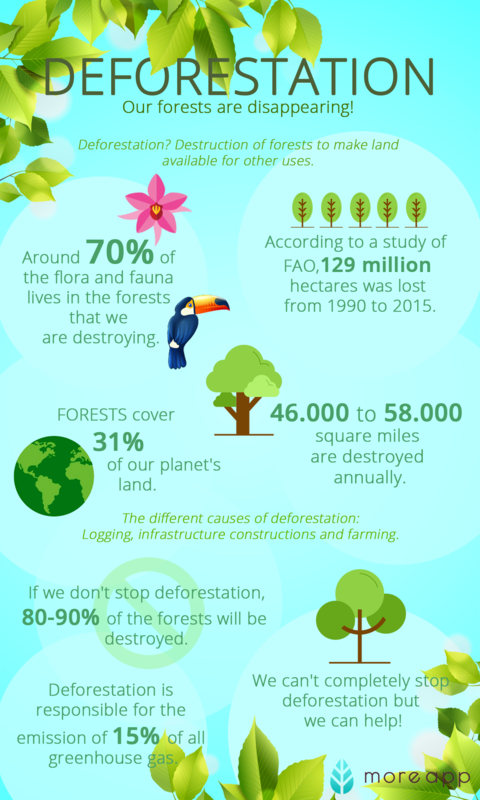 Around 70% of the flora and fauna live in the forests that we are deforesting. According to a study done by the FAO, from 1990 to 2015, about 129 million hectares of forests were lost. Nowadays, not only the production of paper leads to deforestation in the main forests but also the trees that have always been in the cities are being cut down, in order to create new infrastructures What can we do to prevent it? To change this situation we all must help. That is why MoreApp encourages companies to stop working with paper forms by switching to digital forms. Maybe it is not the final solution to eradicate the problem completely, but everything helps to improve. Together we can change the world. This change starts with you. Are you ready? Sign up for free!